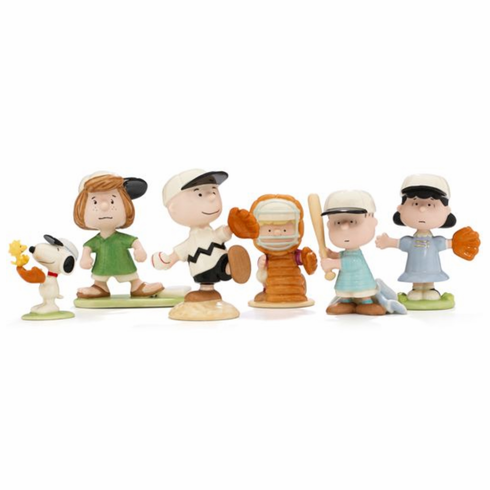 The whole PEANUTS gang - CHARLIE BROWN, LUCY, LINUS, SCHROEDER, PEPPERMINT PATTY, and SNOOPY" are playing baseball in this delightful figurine set. Masterfully crafted of ivory china, meticulously hand-painted, and accented in gold, this wonderful set of your favorite PEANUTS characters is a perfect gift for the whole family. Under license by Peanuts, which has reviewed this product for quality and authenticity. Charlie Brown measures appx. 4" tall. Copyright © 2000-2019 Everything Baseball. All rights reserved.